Swaddling is the current trend in baby sleep. 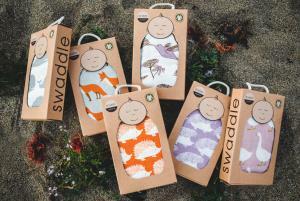 Getting the right fabric is crucial to the entire swaddle experience and these ultra soft organic cotton swaddles are just stretchy enough to get your baby swaddled in nice and tight. With lots of choices out there these super cute patterns will make their way from sleep to your shoulder and to the stroller while showing off your hip parent personality.